Our mission is to provide compassionate, high-quality veterinary care while providing our clients with educational tools in all aspects of animal care and ownership. All Pets Animal Hospital and Rehabilitation Center has one of the most advanced diagnostic bloodwork systems available in veterinary medicine, and this aids our experienced veterinarians in making diagnoses. The boarding facility at All Pets Animal Hospital and Rehabilitation Center is completely updated, climate controlled and kept immaculately clean for the benefit of all pets under our care. The caring and experienced veterinarians at All Pets Animal Hospital and Rehabilitation Center are proud to provide physical rehabilitation for pets in our community. Our rehabilitation team is dedicated to relieving pain, healing, and bringing as much quality of life to our patients as possible. Need to refill your pet's medications? Thank You All For Helping Us Celebrate! 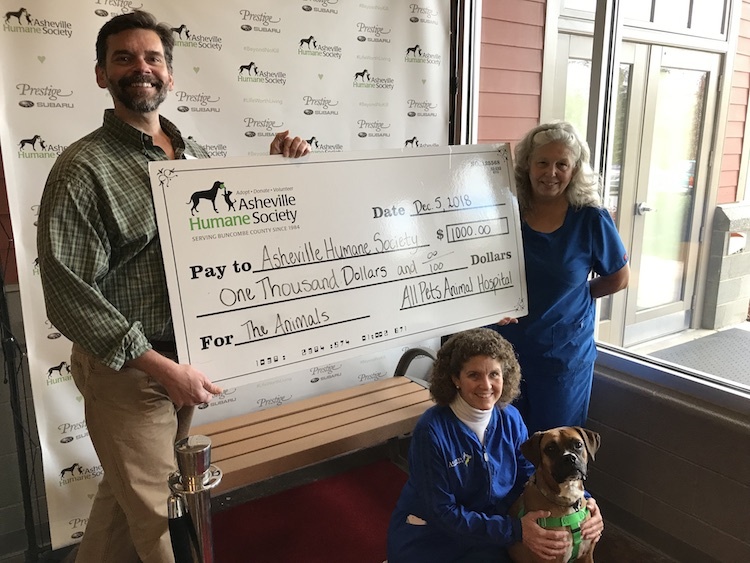 The Asheville Humane Society fundraiser held during our 25th year anniversary party was a huge success! We were able to present them with a check for $1000!!! THANK YOU to all who were able to be part of our celebration!! All Pets Animal Hospital and Rehabilitation Center provides quality, comprehensive health care to pets in the Asheville, North Carolina, area. Our compassionate veterinarians have many years of combined experience in preventative healthcare, as well as diagnosing and treating illness and disease. Our cutting-edge practice includes the latest in veterinary technology, which aids our doctors in providing the best care available for your pet. The broad range of cutting-edge technology and veterinary services offered at All Pets Animal Hospital and Rehabilitation Center makes our practice the right choice for your pet. Rehabilitation therapy is available for pets recovering from surgery, injury, and disease. Our rehabilitation center includes an underwater treadmill, balance disks, and peanut balls, all specifically designed to improve a pet’s quality of life, depending upon their condition. Additionally, our hospital has an advanced diagnostic laboratory and digital x-ray system to quickly and accurately assesses our patients, meaning treatment can begin immediately if necessary. Our surgical suite includes the latest in monitoring equipment and surgical tools to assist our veterinarians in providing the best possible care to your pet. Cancerous conditions can be diagnosed and treated with chemotherapy at All Pets Animal Hospital and Rehabilitation Center. Pain prevention and management are the primary goals for our patients at All Pets Animal Hospital and Rehabilitation Center, as our caring veterinarians understand our pets feel pain in much the same way we do as people. Our caring doctors prevent and treat pain with the most safe and efficacious products available, as well as provide laser therapy for certain chronic painful issues. Additional services include dental care, dermatology assessments and treatments, and nutritional counseling. Microchipping of pets is always recommended at All Pets Animal Hospital and Rehabilitation Center, to provide your precious pet a form of permanent identification which will give them a more significant opportunity to be returned home in the event they become lost. Finally, All Pets Animal Hospital and Rehabilitation Center offers a comprehensive pharmacy, complete with competitively priced products which are guaranteed by the manufacturer of the medication. At All Pets Animal Hospital and Rehabilitation Center, we understand you have a choice in where you take your constant pet for care. Our compassionate and experienced veterinarians, advanced tools and equipment, and competitive pricing make our clinic the leader in the Asheville area for veterinary care. Allow up to provided quality and compassionate care for the life of your precious pet and schedule an appointment with us today! We provide better care because Asheville is our Home and our neighbors matter. We believe that every interaction reflects the passion we feel for animals and the compassion that your family truly deserves.